And as of yesterday the asteroid is closer than that. 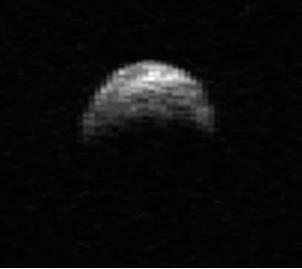 Arecibo begins to observe the asteroid today if I remember correctly, and tomorrow will be closest approach. It's interesting to see size comparisons being made about this asteroid: most say that "asteroid the size of an aircraft carrier" will fly by, a Canadian news article said it was the size of Parliament Hill, another said the size of four football pitches, another a small mountain. JP Aerospace has gotten some attention here today for their innovative plans to get to space by using airships. It's quite a simple concept and as far as I know they continue to test their designs on private funding and their own free time. Phobos-Grunt launches tomorrow, Russia's first interplanetary mission since 1996. Good to see Russia back launching these types of probes, and don't forget that China's Yinghuo orbiter is hitching a ride too.